Even the most ardent defender of old book smell has to admit that digitizing the vast and essentially unending stream of texts, both old and new, is a valuable use of technology. E-readers aren't anti-book, they're just space savers for voracious readers. But one particular proponent of the e-reader, a graphic designer named Erik Schmitt who worked on the original Kindle, found out their limitations first hand. In 2007, while working on the Kindle, Schmitt inherited an impressive collection of poetry, philosophical treatises, and classics from his late grandfather. Strewn throughout the texts were fascinating bits of marginalia that illuminated both the books and the life of his grandfather. Schmitt recognized that despite the benefits of the then-forthcoming Kindle, these invaluable and unique scrawlings would be lost in the age of e-readers. "I was working in technology," Schmitt, now 55, told the Huffington Post, "but I realized that in our excitement about the future, we were leaving these fascinating artifacts behind." Now, Schmitt is working to bring marginalia into the modern age with a new technological venture. 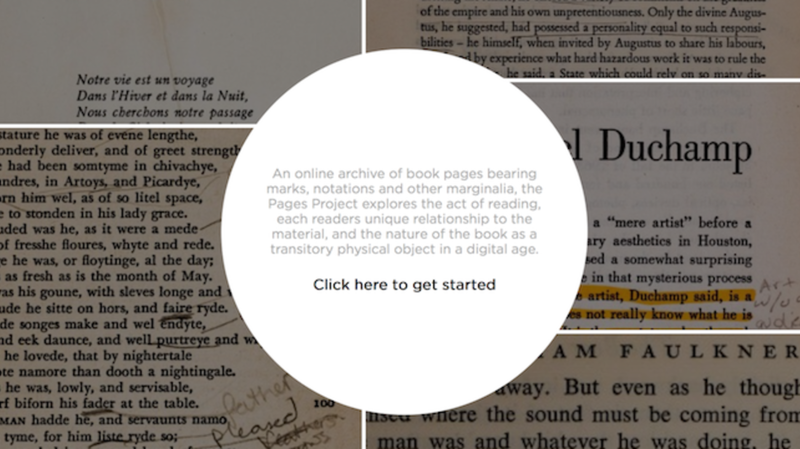 After several years of scouring bookstores in his hometown of Berkeley, Calif. he launched The Pages Project, a beautiful website that digitizes specific examples of marginalia with an inviting format that encourages exploration. For now, the site features just 50 texts, including The Essential Tales of Chekhov, and Selected Writings of Gertrude Stein, but its "Submit a Page" function invites users to comb through their own collections and upload interesting marginalia. "I'd like people to reflect on what may be lost as we move further into the digital age," Schmitt says. "This period in our history might never be repeated."